At Bella10, we are all about the natural nails! We know it takes care and time to create a beautiful set of natural nails and smooth, healthy skin and cuticles enhance the overall appearance. Bella10 supports natural nail care through skilled nail technicians, personal nail care and great natural nail care products. We always recommend regular manicures, whither done by a licensed professional or at home, by yourself or with friends. Bella10 does recommend being a knowledgeable consumer when choosing a nail salon, nail technician, nail care product or tool. Bella10 is here to help. Mary first came in to the salon on the last day in January 2013. She had delayed in coming in to see me after she and I had a brief phone consultation right after Christmas of 2012. She told me that she had a New Year's resolution goal to have her own natural nails again but she really didn't think it was possible. 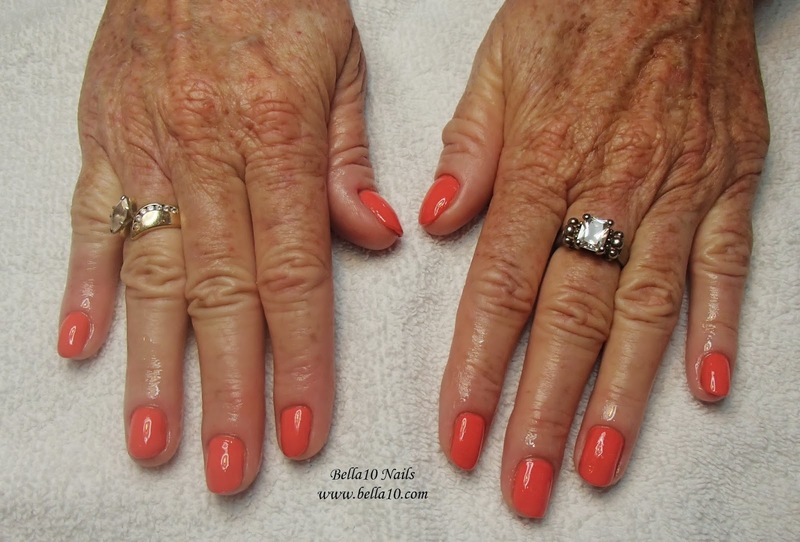 She had been wearing acrylic nails for approximately 30 years. 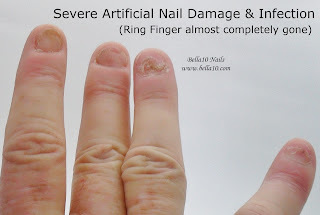 I told her that damage happens from the first time you apply artificial nails due to filing across the top of the nail and persists with fills and lifting. 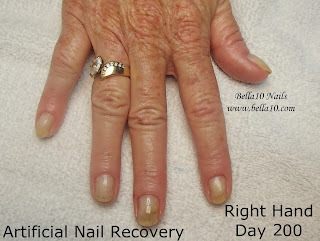 I told her that if she was interested in getting her own natural nails back, I could help her achieve that goal. I have seen all kinds of damage to the natural nail and, at the time, I was unaware of how chronically acute her nail condition was. Mary has been involved in the beauty industry and she had delayed in seeing me because she was embarrassed by her nails. 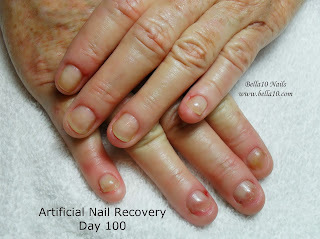 She had told me her nails were bad, and when I saw them, all I could think of was how long this process would take. Mary had some of the worst damage I had seen in a long time and that damage was extensive! This was no easy fix and the biggest thing she needed from me was encouragement! The ring finger on her right hand was practically gone! I was truly concerned and told her that the most important thing she could do is to start treating her nails with Tea Tree Oil (Melaleuca Essential Oil) 2-3 times per day and use cuticle oil every day. I examined her ring finger and noticed that it hadn't gone down into the nail matrix yet, but it was daringly close! Any closer and a physician would definitely be required! Her left hand was not as bad as her right but it still needed a lot of time to heal. 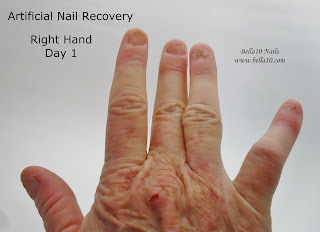 Mary's nail prognosis was hopeful but it would take time and patience for her to get her nails back, and it was still questionable on if there would be any permanent damage to the nail matrix. Day 100 - Marked improvement!!! I am amazed at the improvement, just with Tea Tree Oil. But now I notice another problem, and it is one that is common for this level of damage. Mary has a tendency to pick at her fingers, especially if she sees an imperfection. Mary's left hand is looking much better but her right is still suffering. Her ring finger (which was her worst case scenario on Day 1) looks better than her middle finger. Her middle finger has been the brunt of obsessive behavior because it is one of the prominent nails of her dominant hand. Now it's time for focus on maintenance instead of cures. I give Mary a gentle manicure and only smooth out the very tips of her nails so there is nothing to snag or catch her attention in that manner. I start her on a regimen of nail polish to be applied every other day after today's manicure. I still want her to treat her nails daily with Tea Tree Oil and cuticle oil, but now I want her to start with a clear polish on her nails to help her maintain some strength and I need to minimize any peeling or chipping that may draw her attention to her deficient nail. by Gelish brand Gel Polish. This product does need a UV or LED light to cure it but I found that it works fabulously for damaged or weak nails. I love the two different formulas, one is called Recovery and one is called Strength. If you don't have a UV or LED light, you can use Jessica Cosmetics Restoration, for post acrylic damage, or you can try Starting Over, a Salon Sciences brand that you can purchase through your local Sally Beauty Supply. When the nails look like they do at this stage, they still need a lot of care. 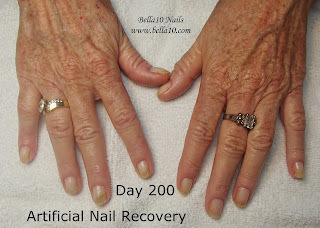 The nails need to remain covered with a strengthener made for recovering nails and remain covered for the duration of the regrowth. I don't hear from Mary for a while again. Finally, when I do hear from her, it is to take pictures of her nails again and the growth she has achieved! I can hear the excitement in Mary's voice. Day 200 - All I can say is WOW! Mary is in awe of how strong her nails are and how great they look. She never thought her nails could be this strong! Mary's nails are now on the road to permanent recovery! There is still some issues that need to be addressed, but her nails are strong, resilient and they look so-o-o much better than they did when she first came in. 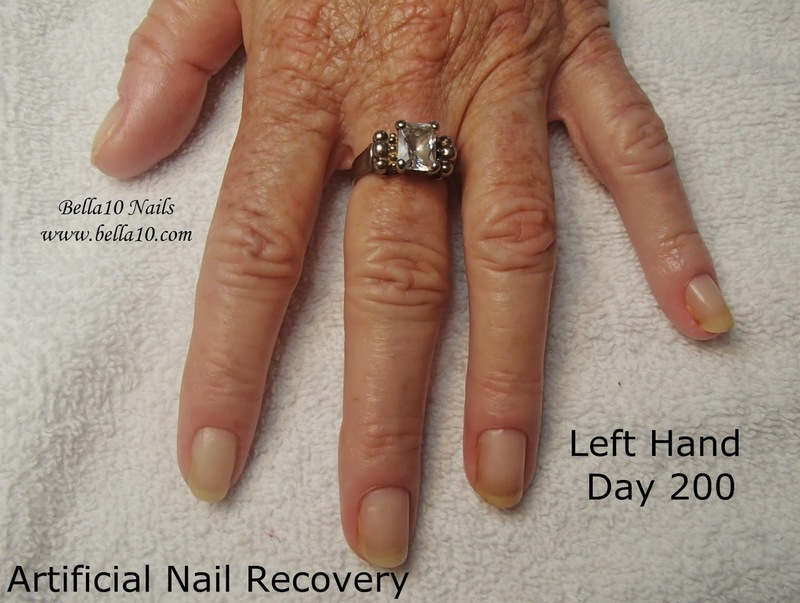 Mary's nails can only get better from here and it is always gratifying to see the transformation from disaster to healthy nails! Check out the right hand!!! Amazing! Isn't it?! According to Mary, her nails have never looked this great or have they been this strong! She says her nails were always weak and flimsy, now they are strong, yet flexible and withstand breakage even if she is a little hard on them. It is amazing to my clients when they finally achieve healthy natural nail growth and they can't believe how strong and healthy their nails really are! Tea Tree Oil (Melaleuca Essential Oil) - great for damage recovery because it prevents and helps to heal bacterial and some fungal infections. 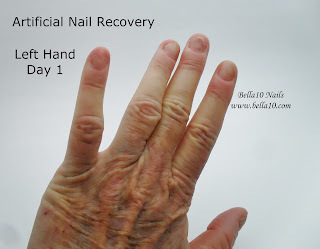 Post Recovery Nail Strengthener - gotta keep those nails covered to minimize nail anomalies and irregularities. 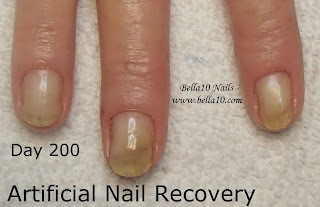 There is also a gel polish called Recovery, by Gelish, that can help with covering and strengthening the natural nail. However, a UV lamp and regular and proper removal of the gel polish is required. Cuticle Oil - to keep the cuticles smooth and the natural nails hydrated and flexible. Of course, I recommend Bella10 CutiOil because of it's all natural blend that softens the cuticles and hydrates the nails. When used regularly, CutiOil will minimize breaking and peeling of the natural nails and help eliminate hangnails. 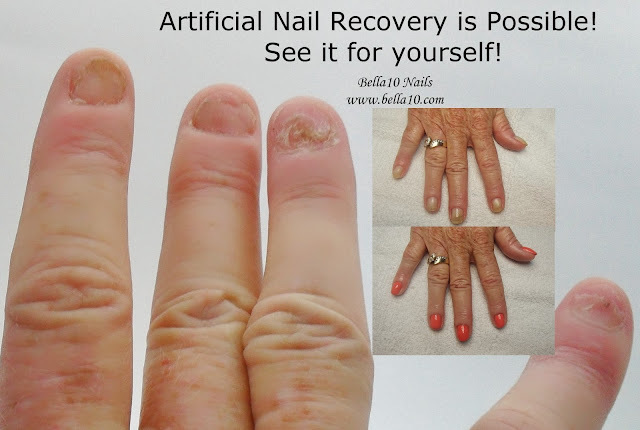 Artificial Nail Recovery IS Possible!!! If Mary can do it, so can you. All it takes is Patience and a little Perseverance! Take the challenge! Your nails can be better than they were before artificial nails! Thank you for posting this! I'm a little late to the game reading it, but it gives me hope! I have horrible nails...horrible. I've always been ashamed and embarrassed of them. Mine is not only due to artificial nails. When I was younger, my hand was locked in a car door and obviously damaged the nails. To add insult to injury, I've always been a nailbiter, but it got worse after that. While nailbiting is not so much the problem now, it definitely doesn't help! However, the picking at imperfections thing really rang true for me, which ends up always making things worse. You are probably nowhere near Chicago and I don't know any nail techs who wouldn't look at my fingers. Everytime I go for a pedicure, my mother brings up my nails and I feel so ashamed, I'm afraid to even ask! Any other tips you can suggest would be greatly appreciated! I'm massaging the tea tree oil and cuticle oil daily. Headed to Sally Beauty for the strengthener after work, but I'm hesitant about the manicure. I plan on talkin' to my mother's best friend who is currently going to school for the same. Any tips to pass on to her would be great! 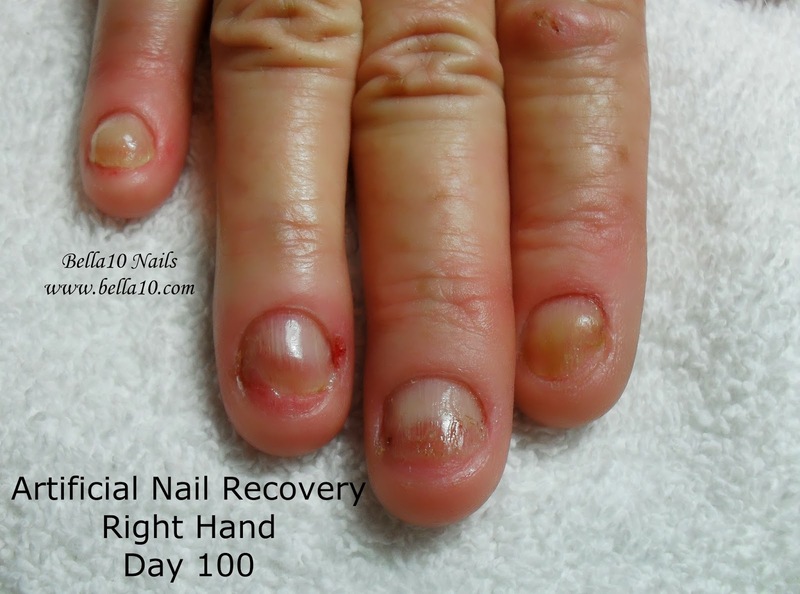 Again, thanks for posting this...gave me a little hope that there might be a light at the end of the tunnel and that I can have nice natural nails someday! Don't be too hard on yourself and your nails Stupid Cupid! I've had many clients like you who, with a little care, made their nails more presentable than they ever thought they could. Don't be embarrassed and go get a basic manicure or give yourself one. A simple manicure can dress up the worst nails. And yours could not have been worse than this case. 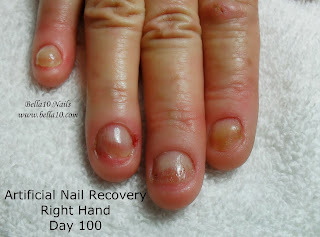 If you still have a nail infection, continue with the tea tree oil. If not, just do a cuticle oil daily. Keep polish on them regularly. It never hurts to start a good habit, a manicure, regular cuticle oil and hand cream, and keeping your nails polished, even if it is just a clear coat. If you would like to find a good salon for a manicure in the Chicago area, I recommend going to http://safesalonrating.com/app/find.php for the best salons to go to. WOW, thank you so much for that post. I have also horrible nails... Not only I can't stop biting them but I have been wearing artificial nails for a long time now (15 years). Now, I want to get my natural nails again but they are so horrible. I am ashamed of showing my hands and some people try to stare at them as if I was a monster. It is so embarrassing and shameful. I bought everything you mention in your post. Now, I must stop putting my fingers in my mouth... as for some reason, each time I feel something like a nail thread or a dead skin, I have to tear it off... I decided not to use my teeth to do anything any longer but to use a clipper that will cut instead of tear... I push my cuticles very regularly but lately, they are stuck on the bed nail and that bothers me because I am the impression that it avoid the proper growth. I keep pushing them though and I cut the dead skin. I know that it will take time to fully recover. Fortunately, my nails are not as bad as your pictures but still. Some of my nails have bumps because I filed them and the nails were so thin and weak, when you file them, they grow thicker. As a result, they have bumps and like holes and it is what make them so ugly... I wish I could wear gloves all day... but working a lot on computer, it is not possible at all... I try to give myself a manicure every week. I forgot to mention that, on top of the products you mention, I also purchased some Mavala products that are also excellent for damaged nails. I forgot to ask an important question. Is there a nail polish that is not shiny as the shine attracts people attention and it is NOT what I want. Or, what/how would you take off the shine from the nail protector ? I tried to buffer my nails with a lime but I am afraid to remove the UV Gel like protection. Hi Flocon. 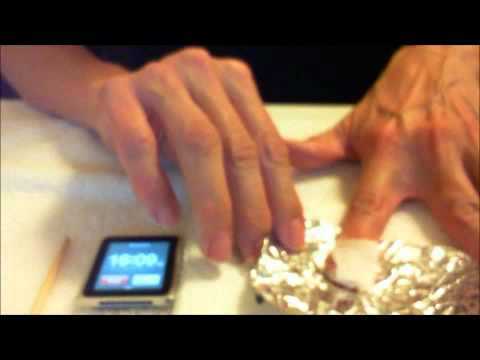 It sounds like you are doing some of the most important things when taking care of your nails. Giving yourself regular manicures is important. I understand how hard it is to stop the habit of biting your nails and cuticles but you seem to be on the right track. Keep up the good work! I must say that your cuticles will not impede the growth of your fingernail and pushing the cuticle back makes your nail more groomed and clean. 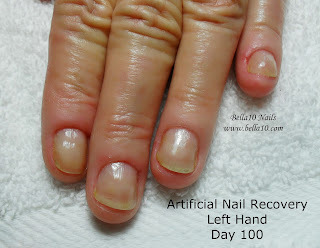 Use a cuticle remover to gently push them back. Try not to cut your cuticle too much as it does protect your nail from infection. You can also use a matte nail polish over your gel polish to camouflage the shine on your nails. This should detract attention. Let me know if you need more help. Hi, I've damaged my nails after prolonged use of acrylics. They've all been removed bow and I am treating with tea tree oil and bio oil everyday. I'm so glad I've seen this as I'm so worried about my thumb nail. It's split from root to tip and very short exposing my nail bed. It isn't sore. I am worried it will never grown back in one nail again. How can you tell if the matrix has been damaged? Tanq so much for your post.. I have okay nails but not very strong,, it keeps splitting in the ends and a layer on edge of the nail is very week hence im worried.. I wud like to have good nails, looking good all the time.. sometimes i hide my hand wen i c some beautiful nails and clear skin of my friends.. Please suggest.. and also the skin on my hand is dark and looks like wrinkles.. Thank you, yes I will have to see my doctor I think :(. Thank you for your advice. Natural nails are beautiful! They make us feel clean and well groomed. For women, they are our secret way to feel feminine. They are also a tool for the power of touch… Sensual back scratches given to loved ones. Natural nails are a challenge and a standard to live up to! Natural nails are a display our health and wellness, as well as good grooming. How many times do you get complimented on your nails? Your natural nails? Don’t believe you can have beautiful, natural nails? We believe you can! Hi, my name is Alicia Lyons and I have been a licensed cosmetologist, specializing in nail care since 1982. I've seen many trends in the nail industry come and go; acrylic and gel nails, French manicures, gel polish and the explosion of new nail salons. I was lucky enough to be listed as one of Sedona, AZ “Top Six Spa Therapists” by Sedona Monthly magazine. In 2008, I authored "The Secret to Beautiful Natural Nails", because I wanted to share specific details, tricks and techniques I’ve discovered about natural nails over my years as a Nail Technician. This blog was started to share my professional input over the anything related to nail care and to promote a line of nail & skin care that I developed, Bella10. My goal is to educate about home nail care and to encourage the use of qualified, licensed nail technicians. 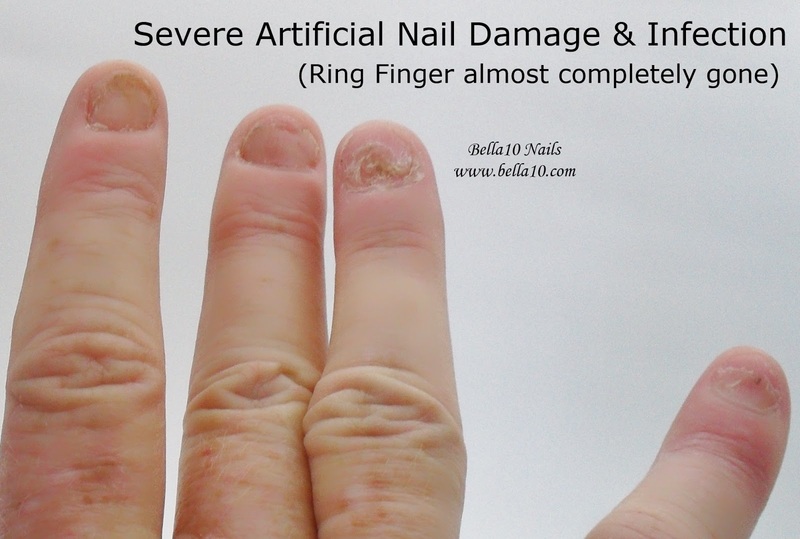 I believe in nail services that prevent damage, injury and infection. I also believe that anyone can have beautiful, healthy nails if they give it a chance. I hope you enjoy my Blog and my website, www.bella10.com. 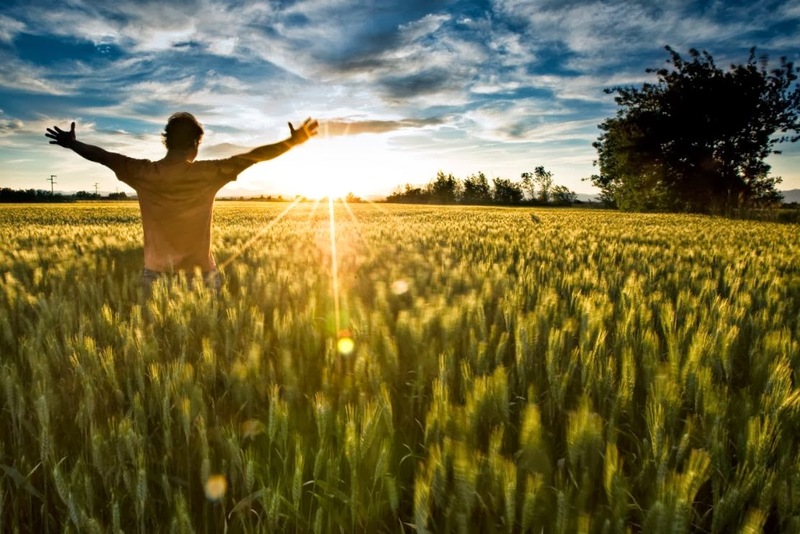 Natures Pharmacy - It can change your life! Shop Ulta for the Best Cosmetics! Do You Have a Nail Care Regime? Personality Quiz - Which Shellac Shade Suits You Best? Take control of your heath care!